Bus from Kuala Lumpur to Jengka (also known as Bandar Tun Razak) is the most convenient and simple way of transportation to get to Jengka. Because of few popular universities like MARA University located in Jengka, many students rely on this direct express bus service to go to Jengka from Kuala Lumpur. 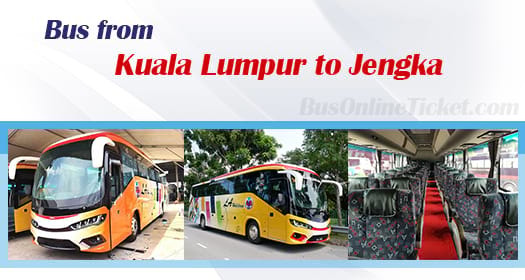 LA Holidays is the only bus operator offering bus from Kuala Lumpur to Jengka. LA Holidays is a fast-emerging bus company and it is popular in providing excellent express bus service to passengers. All the LA Holidays buses are equipped with air-conditioner, spacious leg room and reclining seats which can be adjusted as needed. Moreover, LA Holidays VIP buses also have Free WiFi and USB charging ports so passengers can go online and stay connected to their family and friends during the journey. Bus from Kuala Lumpur to Jengka is having up to 6 daily trips. The first departure starts in the morning at 10:00 AM and the last bus leave TBS at 6:00 PM. The average duration for bus from Kuala Lumpur to Jengka is about 3 hours depending on the road traffic conditions. One washroom break will be given to passengers. Passengers may request an additional break from the driver during the journey. The bus fare is reasonably charged at RM 18.00 with the comfortable VIP seating. The pick-up point for bus from Kuala Lumpur to Jengka is located at Terminal Bersepadu Selatan, also known as TBS. Apart from taxi, you can easily access to Terminal Bersepadu Selatan by KTM, LRT and intercity bus. Upon reaching Jengka, the bus driver will drop off all the passengers at Jengka Sentral. Students who want to go back to hostel in university can take taxi or share van to their respective hostels. Check out the available bus from Kuala Lumpur to Jengka now! Booking bus ticket online via BusOnlineTicket.com is always the most convenient way to get your bus ticket. Booking online saves your precious time and money to travel to bus terminal just for a ticket.